While in town for their 2012 PLAY! 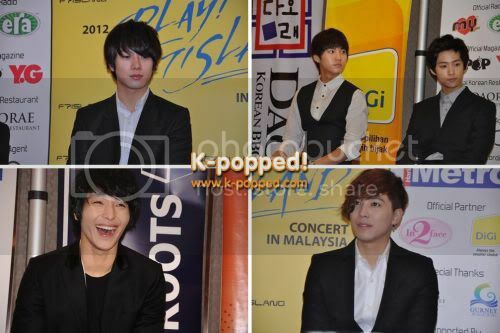 FTISLAND Concert in Malaysia, rock group FTISLAND met the Malaysian media on Jan 14. The press conference, which started at around 10:30am, was abuzz with excitement. Held at the DoubleTree Hilton in Ampang, the event was hosted by Natalie Kniese from Hitz.fm. Read on to find out what K-popped! managed to ask the quintet at the press conference. You held a “Meet The Fans” session last night. What do you think of them (your fans)? 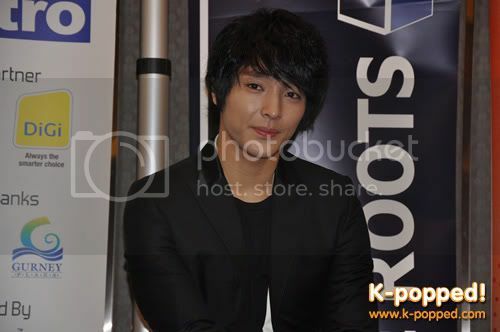 Jonghoon: Oh, it really has been a long time since we met our Malaysian fans up close. We had a great time meeting them and as this is our first time holding a full fledged concert in Malaysia and we hope that our fans will have a good time at the concert. Are there any new challenges FTISLAND members would like to pursue this year? Seunghyun: I think I would like to try acting, but more importantly, I hope that we can express ourselves with more varieties of music this year. What sort of music do FTISLAND members listen to? Hongki: We listen to all kinds of music. What can we expect from FTISLAND in 2012? Hongki: This year, we will make our comeback stage by releasing a new mini album in February. Also, we will be releasing a full album towards the end of the year. 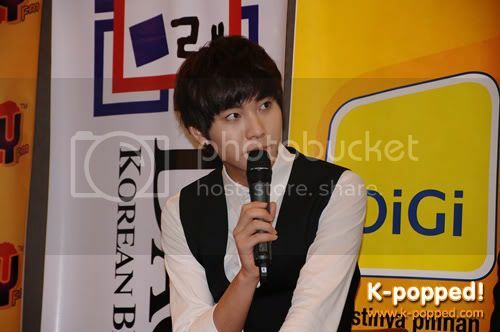 In 2011, FTISLAND was very active internationally…promoting the band outside Korea. What about in 2012, will you be touring to more countries soon? Hongki: Actually we started the Play! Asia Tour in 2011, and we are continuing it now. And yes, we will be touring to other countries as well in 2012. This is a bit of a fashion question for Hongki. What is the concept of your nail art for tonight’s concert? Hongki: Today, it’s a blend of gold and black, for a good impact. And on my forefingers is my “mascot”, a skull. What is the difference between your very first visit in Malaysia back in 2008 and now? Hongki: Due to certain issues, we could not have our concert back then. But this year, we ARE having a concert. This is actually a ‘routine’ question for all foreign artists. Have you had any Malaysian food? If you have, what is your favorite? 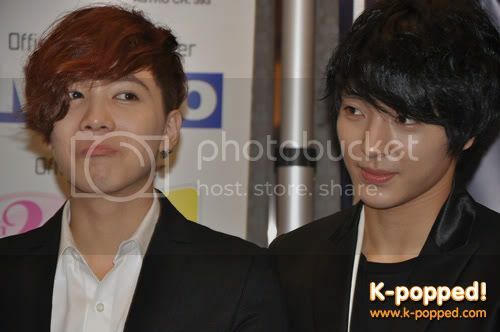 Hongki: We actually just had packed food since we arrived, so we have not tried local food yet. But we hope to try Malaysian food after the concert. FTISLAND received two awards at the 26th Golden Disk Awards in Osaka recently. So what is your resolution or ambition in singing or acting? 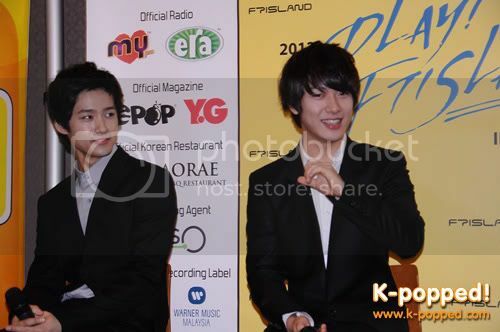 Hongki: Yes, we were grateful to receive two awards at the Golden Disk Awards, one was the “Best Rock Musician”. As for our future plans, since we will be releasing new mini album soon, we will be very busy promoting it. However, if time permits and the scenarios suit us, perhaps we might try acting too. There are a lot of talented artists in FNC Music such as CNBLUE, M Signal, Oh Wonbin and Juniel. Can we expect an “FNC Family Concert” any time soon? Hongki: Yes, that might be possible. Maybe a concert together with CNBLUE, Wonbin and Juniel. This year, a new girl group from FNC will make their official debut and we might collaborate with them too. Also, a collaboration with CNBLUE. As for the family concert, that is actually what FTISLAND and CNBLUE always talk about whenever we hang out together, so yes, it might be possible.